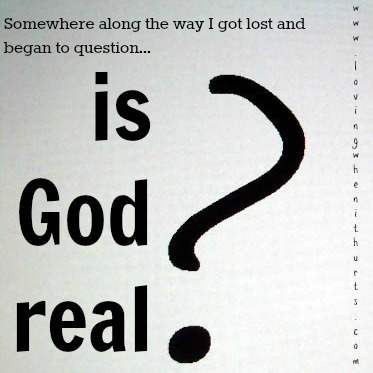 Loving When It Hurts: Is God Real? Lately, I have found myself questioning faith. No, not questioning my faith. Just faith in general. I've been thinking about it in terms of being on the outside looking in. From the viewpoint of someone who cannot understand how us "crazy Christians" can believe something so absurd. That there is one true God who loved everyone with reckless abandon. That there was a man, that same God's son, who walked the earth, lived and breathed. That he worked miracles and spoke words that sounded insane. That he died on a cross meant for sinners, though he had not sinned. That he rose from the dead, by the power of his Father, and now lives in our hearts. When I think about it for too long, I start to wonder how it is that I can believe the way that I do. And I start to think about the other religions out there. What makes Christianity the one true religion, and not just another in the long line of religious beliefs out there? When I was struggling and running from God, I had convinced myself, little by little, that it didn't matter if there was a God or not. Throughout the entire struggle with my marriage and my own heart, I still didn't deny that there was a God. In part, I know my early childhood was a factor in that. I was raised in the church. In junior high, I became very convinced that there was a God that was very real and wanted a relationship with me. In high school and Bible college, that was strengthened and developed more. But then, somewhere along the way, I got lost and began to question everything I believed in. I didn't give up my belief in God completely, but I found myself tempted to think that what I knew to be true was just some made up story. I just gave up my belief that he was active and moving. I stopped thinking about heaven and hell, after finally convincing myself that I didn't care if I went to hell. I knew I was on the path to hell, and I had become so polluted by the world and my toxic relationship with another man that I failed to care anymore. I can remember, in the midst of it all, sitting and thinking about God. I had shoved him aside because I couldn't deal with the reality of what I was doing. I knew it was wrong. I knew to the depths of my being I was in some serious trouble! I made a mess of everything in my life, and I began to believe that it just really didn't matter. This was the only way that I could accept the life I was choosing to live. I had to convince myself that, though it was wrong, there were no spiritual consequences for my actions. I believed that if I died in that moment, I would probably go to hell. And I didn't care! It scares me to look back to that time in my life and admit that. Admit that I was so broken and my mind so blind to the truth that I was willing to risk hell to be happy. It should have scared me then, to have been that blind to the truth. But how do I know that God is real? I find it interesting that as I have been pondering all this, I come across a book that talks about faith and belief. It's not even a Christian book/author. And yet, there are some fundamental truths woven into the book and it all goes along with what I have been thinking about regarding these things. The book is called Hero of Ages: Mistborn Book 3, by Brandon Sanderson. I listened to this trilogy years ago, in the midst of my affair. And so, it makes sense to me that what stood out to me today didn't back then. I just love that God uses whatever is going on in my day to day life to reinforce something he is teaching me or wants me to share with others. Which would he be? Believer or skeptic? I do want to believe, he thought. That's why I've spent so much time searching. I can't have it both ways. I simply have to decide. Which would it be? He sat for a few moments thinking, feeling and most important, remembering. I sought help, Sazed thought. And something answered. Sazed smiled and everything seemed a little bit brighter. Breeze was right, he thought, standing and organizing his things as he prepared to go. I was not meant to be an athiest. The thought seemed a little too flippant for what had just happened to him.. Some important decisions were made on a battlefield or in a conference room. But others happened quietly, unseen by others. That didn't make the decision any less importatnt to Sazed. He would believe. Not because something had been proven to him beyond his ability to deny, but because he chose to. Basically, whether we believe comes down to our experiences. Simply reading the Bible, or hearing the Word in church, or having Bible knowledge isn't going to determine whether or not you believe that the God of the Bible is the one true God. You can have all the Bible knowledge, know all the debates and arguments. You can become a scholar. I was raised in the church, as I mentioned previously. I went to Bible college. I married a man who loved God with all his heart. Yet none of those experiences, while fundamental to my faith, made me believe that God is who he says he is. That Jesus is the Messiah, who died for my sins, and the sins of the world. That Jesus rose from death so that I could have a second chance and hope for eternity. What cultivated my faith, what my belief in God came down to, was the choice to believe. In the midst of depression and chaos, I chose to ignore God. I turned my back on the doctrine I was raised with. If you have been in the Christian "circles" long enough, you know that saying "It's not about religion. It's about a relationship." I understood that in my mind, all the times I heard it. But the truth of it didn't really reach into my heart until I had become so broken and played a part in destroying my marriage, my home, and my own life. The reason that I believe comes down to what I have experienced. Because there have been moments (more than I can count!) that something has happened and there is no explanation. It's no mere coincidence. He seeks to win our hearts back to himself. He reaches into our lives and makes his presence known. Sometimes though, we are so focused on our own selfish desires that we are blind to the movements of God. I can't even imagine the times that God spoke to me through a person or song (which I tried not to listen to at that time because I knew he'd speak), and I ignored him. I know there were times I had become so familiar with the devil's voice that I was incapable of hearing God. I didn't recognize the Shepherd's voice, because I wasn't following him. So I know that I missed a lot in those years I spent wandering around, giving in to my own selfishness. When we take the focus off of ourselves and what we want, and we choose to believe that God is there because of all the evidence of his movement in our lives and the world around us, we experience joy and peace and contentment that can't be explained through doctrine or theology. Because my husband is walking in victory over an addiction that on his own he could not break free from. He tried. No amount of trying or wishing or praying gave him victory. God in his life, speaking and working, freed him. Because I am living in a restored marriage that Kris and I sought to unwittingly destroy. Our marriage was dead. I didn't care. And Kris was clueless to how bad things really were. Nothing I did and nothing Kris did brought our marriage back to life. No cosmic force brought us to a place of healing. God did. Because my heart was so hardened towards God, Kris, my kids, and life in general. And now? Now I have a tender, responsive heart-that no earthly force or being could have given. Because I can so openly share my struggles with others, when the human side of me wants to hide it. Do you think if there weren't a God working and moving in my life I would tell my story in this fashion? Trust me. I wouldn't. Because I look at my kids and I see them grow and want to be more like Jesus. I hear them singing songs about God, or talking about him. We didn't force them to believe. There is something inside of children, inside of all of us, that wants to believe that there is a God. Because I have a joy and peace and contentment that has no explanation. It doesn't come from within me or positive thinking. If you've known me for a long amount of time, you know that I tend to gravitate towards negativity. Or, I used to. I didn't just wake up one day and think "I'm not going to be negative anymore" and then wasn't. God changed that in me. Because I have heard God say "Share this" or "Do this." Perhaps not audibly, but through song lyrics or thoughts that randomly come into my mind. A gentle tugging that I can feel, on my heart, calling me to walk each day living in Christ's victory. Because I have women pouring out there hearts to me, saying how God has spoken to them because I have been obedient in writing out my story. People have been encouraged by virtually going through this journey with me, and have sent me countless emails asking for prayer and sharing the darkness that they are too afraid to share with others, for fear that they may be judged. I didn't do ANY of that on my own. It has been God working through me and touching the hearts and lives of others. I have no power, and make no claims for credit. God has done this. I choose to believe, rather than be a skeptic. I am trying here to prevent anyone saying the really foolish thing that people often say about Him: 'I'm ready to accept Jesus as a great moral teacher, but I don't accept His claim to be God.' That is the one thing we must not say. A man who said the sort of things Jesus said would not be a great moral teacher. He would either be a lunatic--on a level with the man who says he is a poached egg--or else he would be the Devil of Hell. You must make your choice. Either this man was, and is, the Son of God: or else a madman or something worse. You can shut Him up for a fool, you can spit at Him and kill Him as a demon; or you can fall at His feet and call Him Lord and God. But let us not come with any patronizing nonsense about His being a great human teacher. He has not left that open to us. He did not intend to. We are faced, then, with a frightening alternative. This man we are talking about either was (and is) just what He said, or else a lunatic, or something worse. Now it seems to me obvious that He was neither a lunatic nor a fiend: and consequently, however strange or terrifying or unlikely it may seem, I have to accept the view that He was and is God. God has landed on this enemy-occupied world in human form. Next time you find yourself tempted to chalk something up to coincidence, take a moment and ask yourself "Could this be Jesus in disguise?"